1. Testimony of William Chaunt in Shannon McSheffrey, ed., “Consistory: Testimony in the Late Medieval London Consistory Court,” http://consistory.cohds.ca/obj.php?object=deposition&action=view&id=41&expand=actors (October 31, 2017). 2. Trin. 12 Hen. VII pl. 2 f. 22a; trans. from Kiralfy, A. K. R., A Source Book of English Law (London: Sweet & Maxwell, 1957), 436; the Law French is from the Vulgate Year Books Reprint, in David J. Seipp, “An Index and Paraphrase of Printed Year Book Reports, 1268–1535,” 1497.006, http://www.bu.edu/law/seipp/ (January 26, 2018) (hereafter the Seipp number only will be given). The evidence here is from a year book, not the official roll of the court. Year books were unofficial reports, made by law students and practitioners who were interested in the arguments used in open court rather than in the verdicts. See further Baker, J. H., An Introduction to English Legal History, 4th edn (London: Butterworths, 2002), 178–80; Ives, E. W., “The Purpose and Making of the Later Year Books,” Law Quarterly Review 89 (1973): 64–86. 3. Trin. 4 Hen. VI pl. 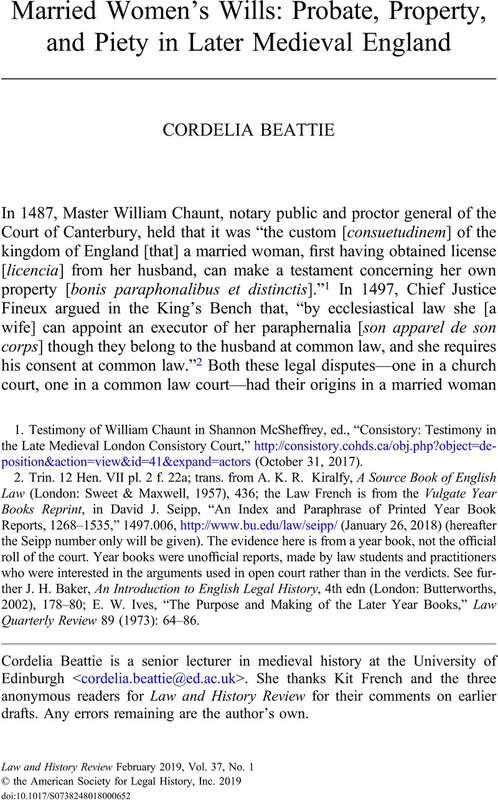 21 f. 31; Seipp 1426.050; discussed in Butler, Sara M., “Discourse on the Nature of Coverture in the Later Medieval Courtroom,” in Married Women and the Law: Coverture in England and the Common Law World, ed. Stretton, Tim and J., Krista Kesselring (Montreal: McGill-Queen's University Press, 2013), 30–32. 4. Helmholz, Richard H., “Married Women's Wills in Later Medieval England,” in Wife and Widow in Medieval England, ed. Walker, Sue Sheridan (Ann Arbor: University of Michigan Press, 1993), 175; Donahue, Charles Jr, “Lyndwood's Gloss propriarum uxorum: Marital Property and the ius commune in Fifteenth-Century England,” in Europäisches Rechtsdenken in Geschichte und Gegenwart: Festschrift für Helmut Coing zum 70. Geburtstag, ed. Horn, Norbert (Munich: Beck, 1982), 20; and Prior, Mary, “Wives and Wills 1558–1700,” in English Rural Society, 1500–1800: Essays in Honour of Joan Thirsk, ed. Chartres, John and Hey, David (Cambridge: Cambridge University Press, 1990), 202. 5. Helmholz, “Married Women's Wills,” 166. 6. Ibid. ; see also Sheehan, Michael M., “The Influence of Canon Law on the Property Rights of Married Women in England,” Mediaeval Studies 25 (1963): 119–20. 7. Helmholz, Richard H., Oxford History of the Laws of England: Volume I. The Canon Law and Ecclesiastical Jurisdiction from 597 to the 1640s (Oxford: Oxford University Press, 2004), 387–88. 8. Helmholz, “Married Women's Wills,” 175. 9. See Sheehan, Michael M., The Will in Medieval England: From the Conversion of the Anglo-Saxons to the End of the Thirteenth Century (Toronto: Pontifical Institute of Mediaeval Studies, 1963), 178, 192; Jacob, E. F. and Johnson, H.C., eds., Register of Henry Chichele Archbishop of Canterbury, 1414–1443, 4 vols., Canterbury and York Society, vols. 42, 45–7 (Oxford: Clarendon Press, 1937–47), II:xix–xxi. The terms are therefore used interchangeably in this article. 10. Donahue, “Lyndwood's Gloss,” 20 n. 3. 11. Sheehan, “Influence of Canon Law,” 113; Donahue, “Lyndwood's Gloss,” 34–35; Pollock, Frederick and Maitland, Frederic William, The History of English Law Before the Time of Edward I, 2nd edn, 2 vols. (Cambridge: Cambridge University Press, 1911), II:407–27. 12. Hall, G. D. G., ed., The Treatise on the Laws and Customs of the Realm of England Commonly Called Glanvill (Oxford: Clarendon Press, 1993), 80. 13. Sheehan, The Will, 291. Helmholz, Richard H., “Legitim in English Legal History,” University of Illinois Law Review 3 (1984): 659–74, at 665, discusses why legitim was not treated as a right guaranteed by the statute law of the church in England. 14. “et maxime de rebus sibi datis et concessis ad ornatum, quae sua propria dici poterunt sicut de robis et iocalibus”: Bracton on the Laws and Customs of England, 4 vols., ed. George E. Woodbine, trans. Samuel E. Thorne (Cambridge, MA: Belknap Press, 1968–77), 2:179. 15. In a King's Bench case of 1311, the serjeants argued about whether a married woman might make a will for the third share. One argued that it was against common law. Justice Rothbury cited clause 18 of the Magna Carta of 1225, which referred to the reasonable shares belonging to wives and children, as support, but the serjeant responded that it referred to the woman as widow: Year Books of Edward II, 5 Edw. II, 1311, Year Book Series 10, ed. G. J. Turner, Selden Society, vol. 63 (London: 1944), 241; and Seipp 1311.295ss. 17. Wilkins, David, Concilia magnae Britanniae et Hiberniae, 4 vols. (London: Sumptibus R. Gosling, 1737), II:705–6; the dating is that offered by Cheney, C. R., “Legislation of the Medieval English Church,” English Historical Review 50 (1935): 415–17. 18. Wilson, Chris Given, ed., The Parliament Rolls of Medieval England, 1275–1504 (Leicester: Scholarly Digital Editions, 2005) (hereafter PROME), June 1344, ii–149, IX. I have altered the translation of “femmes” from “women” to “married women,” as that makes more sense in this context. The citizens of Dublin, also under the rule of the English crown, made a similar complaint in 1347: Gilbert, John T., ed., Calendar of Ancient Records of Dublin, I (Dublin: Dollard, 1889), 145. 19. Donahue, “Lyndwood's Gloss,” 37; here he was responding to, among others, Sheehan, “Influence of Canon Law,” 120, 123–24. 20. Donahue, “Lyndwood's Gloss,” esp. 22. For a discussion of both the work and the gloss, see Ferme, Brian Edwin, Canon Law in Late Medieval England: A Study of William Lyndwood's Provinciale with particular reference to Testamentary Law, Studia et Textus Historiae luris Canonici, 8 (Rome: LAS, 1996), esp. ch. 7. 21. On year books, see note 2. 22. Mich. 33 Hen. VI fo. 31b; Seipp 1454.041. See also Mich. 18 Edw. IV fo. 11b; Seipp 1478.075. 23. Woodbine, Bracton, 2:180; Bateson, Mary, ed., Borough Customs, 2 vols., Selden Society, vol. 18 & 21 (London: Stevens and Sons, 1904–6), II:xcviii. 24. See Gross, Charles, “The Medieval Law of Intestacy,” Harvard Law Review 18 (December 1904): 129–30. 25. See Bateson, ed., Borough Customs, II:108–11. 26. Sheehan, The Will, 295. 27. Bateson, ed., Borough Customs, II:141. 28. Ibid., II:141–42. The equivalent Scottish custom also applied to mothers: ibid., 138–40. Some of the English customs, including that of Godmanchester, referred to the death of parents or ancestors, which could be gender neutral, although the latter goes on to make clear it concerns a man's death: ibid., 141 (“parentum suorum”); see also 142 (“antecessorum suorum”). 29. Loengard, Janet S., “‘Which may be said to be her own’: Widows and Personal Property in Late-Medieval England,” in Medieval Domesticity: Home, Housing and Household in Medieval England, ed. Kowaleski, Maryanne and Goldberg, P. J. P. (Cambridge: Cambridge University Press, 2008), 164–65. 30. Helmholz, “Legitim,” esp. 667. 31. Sheehan, “Influence of Canon Law,” 122. 32. Donahue, “Lyndwood's Gloss,” 36; he referred to an ongoing survey of testamentary practice in late medieval England by Sheehan, but unfortunately, this was never completed. 33. Helmholz, “Married Women's Wills”; and Sheehan, “Influence of Canon Law,” 123. 34. Helmholz, “Married Women's Wills,” 175. 36. Ibid., 180, n. 46, citing Goldberg, P. J. P., “Female Labour, Service and Marriage in the Late Medieval North,” Northern History 22 (1986): 36. 37. Goldberg, P. J. P., Women, Work, and Life Cycle in a Medieval Economy: Women in York and Yorkshire c.1300–1520 (Oxford: Clarendon Press, 1992), 264–69. 38. Helmholz, “Married Women's Wills,” 172. 40. Helmholz, “Married Women's Wills,” 173–74. 41. Prior, “Wives and Wills,” 202. 42. Although in practice, these divisions might not have been kept. See Helmholz, Oxford History of the Laws of England, I:427–29. 43. Prior, “Wives and Wills,” 202, n. 2; Grimwade, M. E., Index of the Probate Records of the Court of the Archdeacon of Sudbury 1354–1700, ed. R., W. and Serjeant, R. K., Index Library, vol. 95–96 (Keele: British Record Society, 1984); Suffolk Record Office, Bury St. Edmunds branch (hereafter cited as SROB), R2/9 and R2/10; Northeast, Peter, ed., Wills of the Archdeaconry of Sudbury, 1439–1474, 2 vols. (Woodbridge: Boydell Press, 2001–10). 44. Elvey, E. M., ed., The Courts of the Archdeaconry of Buckingham, 1483–1523, Buckinghamshire Record Society, vol. 19 (Aylesbury: Buckinghamshire Record Society, 1975). For discussion of how the court material is currently found in four manuscripts, one of which is itself a miscellany of registers, see ibid., ix–xi. 45. For discussion of what was recorded and why, see Elvey, Courts of the Archdeaconry of Buckingham, xxii–iv, xxviii. One man left a bequest of 6s. 8d. for the registration of his own will in 1493; ibid., xxii. 46. Ibid., 23 (Joan Hobbis, 1486), 168 (Alice Mitchell, 1496). There is a third married woman's will in this edition, from 1523, but the process of recording both wills and probate acta changed greatly between 1497 and 1523, hence the sample. Ibid., xxi–ii, 412–13 (Alice Eyre). 47. Robert A. Wood, “Life and Death: A Study of the Wills and Testaments of Men and Women in London and Bury St. Edmunds in the late Fourteenth and early Fifteenth Centuries” (PhD diss., Royal Holloway, University of London, 2012), 12, 44, 153–55. In an earlier article, he had suggested there were seven: Wood, Robert A., “Poor Widows, c. 1393–1415,” in Medieval London Widows, 1300–1500, ed. Barron, Caroline M. and Sutton, Anne F. (London: Hambledon Press, 1994), 56. 48. Sharpe, Reginald R., ed., Calendar of Wills Proved and Enrolled in the Court of Husting, London, 2 parts (London: J. C. Francis, 1889), I:105, 188; and Woodbine, Bracton, II:36. On this court, see Staples, Kate Kelsey, Daughters of London: Inheriting Opportunity in the Late Middle Ages (Leiden: Brill, 2011), 18–22. 49. Kettle, Ann J., “‘My Wife Shall have It’: Marriage and Property in the Wills and Testaments of Later Mediaeval England,” in Marriage and Property, ed. Craik, Elizabeth M. (Aberdeen: Aberdeen University Press, 1984), 95. 50. Helmholz, “Married Women's Wills,” 170. 51. Norfolk Record Office (hereafter NRO), Records of the Dean and Chapter of Norwich Cathedral (hereafter DCN) 69/1; the marital status of the other two women is unclear (5, 12). There is another surviving Dean and Chapter Register for Norwich that contains material from 1447 to 1559, but only 15 of the 257 wills therein predate 1500. Of these, two are by women, one of whom was a married woman: NRO, DCN 69/2 (fos. 8-8v Alice Cobald, married woman, 1468; fo. 15 Marion Albon, widow, 1496). The Register contains two other married women's wills: ibid., fos. 41v (Agnes Blandes, wife of Thomas, 1509), 52v (Margaret Byllarde, wife of Adelarde of Sedgeford, 1529). 52. Cambridgeshire Archives (hereafter CA), VC 1. Three others are possibly by married women: see section titled “Married Women’s Wills in the Probate Registers for the Diocese of Ely, 1449–1505” in this article. There is also one will made by a married couple: VC 1, fos. 22v-23 (Thomas and Helena Smyth). 53. CA, VC 1-4; see also Poos, L. R., ed., Lower Ecclesiastical Jurisdiction in Late-Medieval England: The Courts of the Dean and Chapter of Lincoln, 1336–1349, and the Deanery of Wisbech, 1458–1484, Records of Social and Economic History New Series 32 (Oxford: Oxford University Press, 2001), xxxviii. 54. See Dunning, R. W., “Rural Deans in England in the Fifteenth Century,” Bulletin of the Institute of Historical Research 40 (1967): 207–13. See also Thompson, Alexander Hamilton, “Diocesan Organization in the Middle Ages: Archdeacons and Rural Deans,” Proceedings of the British Academy 29 (1943): 153–94. 55. Poos, Lower Ecclesiastical Jurisdiction, xxvi–xxvii. 56. See ibid. ; this volume includes an edition of the court book. 57. For this reason, Whittlesey will be included in the counts of wills from the Deanery of Wisbech in the other probate registers too. 58. See Poos, Lower Ecclesiastical Jurisdiction, liii. 59. Burgess, Clive, “Late Medieval Wills and Pious Convention: Testamentary Evidence Reconsidered,” in Profit, Piety and the Professions in Later Medieval England, ed. Hicks, Michael (Gloucester: Sutton, 1990), 14–33. See also Burgess, Clive, “‘By Quick and by Dead’: Wills and Pious Provision in Late Medieval Bristol,” English Historical Review 102 (1987): 855–56. 60. Prior, “Wives and Wills,” 207–10. 61. Ibid., 212. Erickson made a similar point using the PCC data: Erickson, Amy Louise, Women and Property in Early Modern England (London: Routledge, 1993), 140–42. Erickson also discussed the chronological pattern, but the statistics are problematic in that some were taken from studies of civic courts (e.g., Bishop's Lynn), which tended only to record the wills that bequeathed burgage tenure, and others were taken from indexes/first lines of wills, which do not give the most accurate data: ibid., 140, 206. 63. Ibid., 214–15. There is an example of this discussed subsequently. Also, in York, the successive wives of Warimbald Harlam both made wills: York Minster Library (hereafter YML), Dean and Chapter Registers, D/C Reg. 1, fo. 131r (Joan Harlam, 1401); Borthwick Institute for Archives (hereafter BIA), York, Exchequer Court, Probate Register 2, fo. 583r (Lawrencia van Harlam, 1408); I am grateful to Lisa Liddy for bringing the latter will to my attention. 64. Prior, “Wives and Wills,” 213–14. 66. See CA, VC 2, fos. 21, 32, 37v, 38, 43v, 64 (x2), 66v, 67, 91v, 104, 109v. This volume has been edited and all subsequent references will be to this edition: Poos, Lower Ecclesiastical Jurisdiction, 267–592. 67. For the seven women described as “uxor,” see Poos, Lower Ecclesiastical Jurisdiction, 373 (Alice Qwyght; Joan Elyott), 389 (Alice Galyarde), 447 (Margaret Kellsull), 448 (Matilda Clerk), 537 (Joan Powdych), 589 (Elizabeth Tailor); for the other five, see pp. 321 (Alice Dowdynett), 356 (Alice Gylbert), 456 (Margaret Freman), 458 (Cicely Freman), 571–72 (Katherine Haukyn). 69. See also Helmholz, “Married Women's Wills,” 167; and Prior, “Wives and Wills,” 203. Compare Chief Justice Fineux in the 1497 King's Bench case: “the husband has proved the will, which proves his consent” (Kiralfy, Source Book, 436). 70. Poos, Lower Ecclesiastical Jurisdiction, 448–49. 71. Ibid., 458: “Item volo quod xl s. distribuantur secundum effectum testamenti Galfridi Mobbe quondam mariti mei, quos xl s. Thomas Mobbe distribuisset si vixisset.” Her husband's will was not recorded in Liber A or B. 72. Ibid., 393, 589. The husband of Alice Dowdynett was rebuked for not having settled his wife's debts to various guilds, but this does not relate to provisions made in her will: ibid., 378, 321. 73. Ibid., 535. In 1463, the churchwardens of Whittlesey, a neighboring parish, told the general chapter that one Robert Galyard was administering the goods of his deceased wife, presumably without the church court's authority: ibid., 363; the first case noted in this session explicitly stated “absque auctoritate ordinarij [without the authority of the ordinary].” This might be about the same will. It is not recorded in either Liber A or B. 75. Here I discuss buildings together with land as real estate, although in some medieval discussions the former were seen as “chattels,” in order to distinguish between wills that bequeath very few goods of value and those that concern substantial property. 76. Poos, Lower Ecclesiastical Jurisdiction, 458. Prior argued that these were common in her period but hard to detect from the wills themselves: Prior, “Wives and Wills,” 203–4. 79. Ibid., 589. There has been an archaeological excavation of a medieval fishery in Whittlesey; see http://archaeologydataservice.ac.uk/archiveDS/archiveDownload?t=arch-769-1/dissemination/pdf/vol42/42_019_044.pdf (December 19 2017). 80. Poos, Lower Ecclesiastical Jurisdiction, liii. 82. Poos, Lower Ecclesiastical Jurisdiction, 373. An interpolation in Bracton stated that if a married woman died, the church should take the second-best beast, if the husband agreed: Woodbine, Bracton, II:178. This was also included in Fleta, a legal treatise written in the reign of Edward I: H. G. Richardson and G. O. Sayles, eds., Fleta, II, Selden Society, vol. 72 (London: Selden Society, 1953), 191. 83. Compare the 1454 case discussed previously; Seipp 1454.041. 84. Poos, Lower Ecclesiastical Jurisdiction, 373. 86. On the importance of keeping candles burning before images, see Hanawalt, Barbara A., “Keepers of the Lights: Late Medieval English Parish Guilds,” Journal of Medieval and Renaissance Studies 14 (1984): 21–37 (esp. 21, 28); Postles, David, “Lamps, Lights and Layfolk: ‘Popular’ Devotion before the Black Death,” Journal of Medieval History 25 (1999): 97–114; and Bainbridge, Virginia, Gilds in the Medieval Countryside: Social and Religious Change in Cambridgeshire c.1350–1558 (Woodbridge: Boydell & Brewer, 1996), 68–69. 87. Blanket and russet wool were set out in the 1363 sumptuary legislation as the materials that agricultural workers, and those with less than 40s. in goods, were allowed to wear: PROME, October 1363, ii–279, 31. 88. Poos, Lower Ecclesiastical Jurisdiction, 373. 90. Loengard, “‘Which may be said to be her own,’” 166–68. 91. Poos, Lower Ecclesiastical Jurisdiction, 447: “ad usum dicti altaris unam albam et j examitum de novo panno.” The “albam” could refer to white cloth or specifically to a priest's long white gown; for the “alb” as a vestment, see Berry, Henry F., ed., Register of Wills and Inventories of the Diocese of Dublin in the Time of Archbishops Tregury and Walton, 1457–1483 (Dublin: University Press, 1898), 201. “Examitum” means six-threaded and, therefore, costly and splendid. It was used, for example, to describe vestments in Evesham Abbey: Rock, Daniel, Textile Fabrics (New York: Scribner, Welford and Armstrong, 1876), 24–25. French and Lowe have argued that men were more likely to give ready-made vestments to the church, whereas women would give the cloth to make them, but Liddy did not find such a gendered distinction: French, Katherine L., “Women in the Late Medieval English Parish,” in Gendering the Master Narrative: Women and Power in the Middle Ages, ed. Erler, Mary C. and Kowaleski, Maryanne (Ithaca, NY: Cornell University Press, 2003), 160–62; Lowe, Nicola A., “Women's Devotional Bequests of Textiles in the Late Medieval English Parish Church, c.1350–1550,” Gender and History 22 (2010): 411–16; and Lisa Liddy, “Domestic Objects in York c.1400–1600: Consumption, Neighbourhood and Choice” (PhD diss., University of York, 2015), 146. 92. Poos, Lower Ecclesiastical Jurisdiction, 447–48. 94. Poos, Lower Ecclesiastical Jurisdiction, 571–72. 96. See Bennett, Judith M., Ale, Beer, and Brewsters in England: Women's Work in a Changing World, 1300–1600 (New York: Oxford University Press, 1996), although she argues that this was changing in the late fifteenth century with the introduction of beer (ch. 5). 97. Poos, Lower Ecclesiastical Jurisdiction, 572. 99. Middle English Dictionary, forcer (n.), https://quod.lib.umich.edu/cgi/m/mec/med-idx?type=id&id=MED16708 (November 8, 2017). 100. BIA, Prob. Reg. 2, fos. 583-583v (Lawrencia Van Harlam). 101. Loengard was sceptical that chains, pendants, and brooches were included as “jocalia,” but she did note that perhaps many women just did not have such items to leave: Loengard, “‘Which may be said to be her own,’” 168. 102. Poos, Lower Ecclesiastical Jurisdiction, 537–38. I would correct “recivium” here to “recinium,” meaning a small veil; ibid., 538. 103. See Crawfurd, Raymond, “The Blessing of Cramp-Rings: A Chapter in the History of the Treatment of Epilepsy,” in Studies in the History and Method of Science, 2 vols., ed. Singer, C. (Oxford: Clarendon Press, 1917–21), I:165–87. For an example of such a ring, see Science Museum, London, object number A641034, http://broughttolife.sciencemuseum.org.uk/broughttolife/objects/display?id=92460 (December 21, 2017). 104. Loengard included wedding rings as “paraphernalia,” but not other rings: Loengard, “‘Which may be said to be her own,’” 168. However, Joan Balderton of Whittlesey, gave away two silver rings. 105. Poos, Lower Ecclesiastical Jurisdiction, 448. 106. In a married woman's will from York, Alice Marchall, wife of William de Craven, disposed of various pots and pans, which she specified had come to her after the death of her previous husband, Thomas Marchall: YML, D/C Reg. 1, fo. 121v (1399). 107. Poos, Lower Ecclesiastical Jurisdiction, 373. 109. Ibid., 321, 335, 384, 421. Although the only heading in the first two of these entries is “Yconomi,” we can assume that this just applies to the top two names, separated out, and that the rest are “inquisitores,” as that is the way the record works in the second two examples. 110. Ibid., 290, 335, 384, 407; as discussed, on 335 only the “iconomi” are labelled. 113. Ibid., 308, 447–48. The will is said to have been made in October 1467 but proved in July 1467; therefore, one of the years is incorrect. 114. In 1463, Margaret Kellsull was presented for sexual immorality with diverse persons and her husband was presented at the same court for harboring those guilty of illicit sexual relations, presumably a linked charge. William Kellsull appeared and denied the charges with the aid of five male supporters. In 1465–66, William faced a similar allegation, denied it, and this time purged himself with seven supporters and was warned to avoid such activity on pain of public penance: ibid., 363–64, 537. That he avoided a punishment the first time and only received a warning the second time suggests that he was believed or that there were extenuating circumstances. For Helmholz, such dismissals point as much to the role of gossip and rumor in ex officio cases, as “to the inherent weakness of methods of proof in the ecclesiastical system”: Helmholz, Richard H., “Harboring Sexual Offenders: Ecclesiastical Courts and Controlling Misbehavior,” Journal of British Studies 37 (1998): 261. 115. On churchwardens, see French, Katherine L., The People of the Parish: Community Life in a Late Medieval English Diocese (Philadelphia: University of Pennsylvania Press, 2001), 68–98; Kümin, Beat A., The Shaping of a Community: The Rise and Reformation of the English Parish c.1400–1560 (Aldershot: Scolar, 1996), 22–42; Burgess, Clive, “Pre-Reformation Churchwardens’ Accounts and Parish Government: Lessons From London and Bristol,” English Historical Review 117 (2002): 306–32; and French, Katherine L., “Rebuilding St. Margaret's: Parish Involvement and Community Action in Late Medieval Westminster,” Journal of Social History 45 (2011): 148–71 (esp. 151–52, 155–56). I am grateful to French for discussion on this matter. 116. Poos, Lower Ecclesiastical Jurisdiction, 274, 399 (Thomas Sorrell). 117. Cambridge University Library, Ely Diocesan Records (hereafter CUL, EDR), C 9/2/86. William Haukyn is named as a juror in entries dated 1461, 1462, 1465, and 1467. 118. Poos, Lower Ecclesiastical Jurisdiction, lxii. 119. CUL, EDR, C 9/2/86. 120. Poos, Lower Ecclesiastical Jurisdiction, lxii. McIntosh had made a similar point: McIntosh, Marjorie Keniston, Controlling Misbehavior in England, 1370–1600 (Cambridge: Cambridge University Press, 1998), 8. 121. See the sources on churchwardens in note 115; on jurors, see Forrest, Ian, Trustworthy Men: How Inequality and Faith Made the Medieval Church (Princeton, NJ: Princeton University Press, 2018), ch. 6. 122. Prior, “Wives and Wills,” 211. 123. Elvey, Courts of the Archdeaconry of Buckingham, 88, 7. 124. Ibid., 118, 8. The husband did not have to pay the fine to have probate registered in 1492 because he was poor. 126. Ibid., 6–7 (here John Master). 127. See Poos, Lower Ecclesiastical Jurisdiction, xxxix, n. 79. The one married woman's will that it does contain is that of Maud Bregge of Triplow, who had some land to give to her husband: CA, VC 3, fos. 2-2v. 128. CA, VC 1, fos. 13 (Margaret Joly alias Lyster), 13v (Emma Elwyn), 15v (Christine Owtyng), 15v-16 (Katherine Towt), 18 (Margaret Coper), 18v (Katherine Howlet), 19v (Agnes Clement), 21v (Christine Marcaunt), 26 (Katherine Hawsold), 27 (Alice Clement), 28-28v (Joan Stevenson), 31-31v (Joan Grene), 34-5 (Alice Mas), 35v (Beatrice Edmunde), 36v (Margaret Scherman), 39 (Joan Bolle; Margaret Wallarde), 39v (Margaret Reynalde), 41 (Alice Makrowe), 41v (Marion Pococke), 42 (Margaret Dawntre), 43v (Katherine Milner; Lettice Galyard), 44v (Margaret Derby), 45v (Katherine Writh), 47 (Katherine Fryng), 49v-50 (Agnes Tyler), 52 (Joan Hamond; Beatrice Kedewyn), 55 (Alice Skotte), 56v (Ellen Bateman), 57v (Emma Belman), 59 (Joan Brice), 60v-61 (Annis Alettes), 61v (Alice Botolf), and 62 (Isabel Edward). 129. CA, VC 1, fos. 66v-67. Her sons were named as executors, both with different surnames, which might suggest she had remarried. 130. The three are Katherine wife of Godfrey Wyn (ibid., fo. 36); Elena wife of Stephen Kelful (CA, VC 1, fo. 42); and Katherine wife of Adam Boole (ibid., fos. 51-51v). 131. CA, VC 1, fo. 18v. 132. CA, VC 1, fo. 41v. The wills of Marion and her husband Robert are discussed in the Wisbech court c.1460-63: see Poos, Lower Ecclesiastical Jurisdiction, 336. For the other 17 wills, see CA, VC 1, fos. 13, 13v, 15v, 18, 19v, 39v, 42, 43v (x2), 44v, 47, 52, 55, 56v, 57v, 59, 61v. 133. CA VC 1, fo. 15v. 134. CA, VC 1, fo. 39. For the other five, see ibid., fos. 28-28v, 36v, 39, 41, 49v-50; the will of Alice Nakrowe (ibid., fo. 41) did not contain any bequests of animals or furnishings, but it did contain a bequest of 6s. 8d. to her son, which is why I have grouped it here. 135. CA, VC 1, fos. 34-5. For the other 10 wills, see ibid., fos. 21v, 26, 27, 31-31v, 34-35, 35v, 45v, 52, 60v-61, 62. In the joint husband and wife will in this register, the land bequeathed came from the wife's relatives; ibid., fos. 22v-23. 136. There are seven wills from Whittlesey: CA, VC 1, fos. 18, 39 (x2), 39v, 42, 43v (x2). It was technically in the Diocese of Ely, but see note 57. The seven other wills are from Sutton (ibid., fos. 36v, 41v), Ely (fos. 41, 49v), Benwich (fo. 55), Downham (fo. 56v), and Chatteris (fo. 61v). 137. CA, VC 1, fos. 28-28v. 138. Alice Dowdynett made a bequest to the servant of William Perch just before the bequest to Agnes Perch: Poos, Lower Ecclesiastical Jurisdiction, 321. For William Perch as juror, see ibid., 270 (undated), 279 (undated), 301 (1479), 378 (did not come), 491 (did not come and name crossed out). 139. CA, VC 1, fo. 44v. 140. CA, VC 1, fo. 44v; CUL, EDR, C 9/2/86. 141. CA, VC 4, fos. 90v-91. For the other six, see ibid., fos 6v-7 (Margaret Doughtteffyer), 8v (Agnes Keyd alias Jackson), 21 (Matilda Whytrett), 22v (Margery Plombe), 23-4 (Isabel Benett), 87v-88 (Alice Clerke). 142. CA, VC 4, fos 41v-42 (1487). 143. CA, VC 4, fos. 24-24v (1495). 144. Bateson, Borough Customs, II:143; I have changed her reading of “unam gatam” from “a cat” to “a bowl”; see Dictionary of Medieval Latin from British Sources, “gata,” 1, http://www.dmlbs.ox.ac.uk/publications/online (July 26, 2018). 145. CA, VC 4, fo. 51v (1489). 146. In this register, five of the ten married women's wills enrolled were from the Deanery of Wisbech, including one from Whittlesey. The others were from March, Doddington (CA, VC 4, fo. 8v), Little Shelford (fo. 41v-42), Hardwick (fo. 51v), and Ickleton (fos. 87v-88, 90v-91). 147. See CA, VC 4, fos 15v (Agnes Persone), 48v (Elizabeth Tauntte), 61v (Marion Sturmyn), and 84 (Margaret Bedford). 148. See Poos, Lower Ecclesiastical Jurisdiction, 448: “Eodem die commissa est administratio bonorum Margarete Rede decedentis abintestato Johanni marito suo et dimissus est propter paupertatem.” The other married women who died intestate are Agnes Stone and Alice Boolde: ibid. 149. CA, VC 1, fo. 57v (wife of John Baret; Katherine wife of John Spynk). See also VC 1, fos. 4v (Elizabeth Cutt), 8v (Katherine Sawnsum), 15 (Margaret Haw), 15v (Margaret Chapman), 16v (Katherine Grene), 43 (wife of John Emreth), 49 (Margery Meyrbek), and 63 (Agnes Gabbys); CA, VC 4, fos. 1 (Annabel Bothe), 15 (Agnes Croser), 52a (Isabel Smyth), 52b (Margaret Goodwyn), 61 (Margaret Symund), 104v (Agnes Plowryght), and 123 (Agnes Karsay). 150. Sheehan, “Influence of Canon Law,” 120–21; reasserted by Ferme in his Canon Law, 139. 151. Helmholz, “Married Women's Wills,” 170. 152. See Prior, “Wives and Wills,” 208–9, for the figures and her methodology. I have identified four married women's wills in the PCC registers 1454–1500: The National Archives, Kew, PROB 11/7/39 (Elizabeth Chittok, 1480); PROB 11/7/304 (Agnes Lytton, 1486); PROB 11/8/87 (Alice Tympley, 1487); and PROB 11/9/273 (Matilda Esterfeld, 1493). 153. Prior, “Wives and Wills,” 213. 154. Helmholz, “Married Women's Wills,” 173–74. 155. Donahue, “Lyndwood's Gloss,” 36; he cites a Canterbury case from 1294 as evidence. 156. Prior, “Wives and Wills,” 201.